Growing a moustache has become somewhat of a lost art among most men nowadays, but if you’re lucky enough to have the ability to grow one, you should know how to take care of it. Nothing can ruin a moustache quicker than improper grooming, which is why you’ll want to follow the following tips in order to ensure your moustache looks healthy, full, and well-groomed. On top of following these guidelines, you’ll likely need some scissors or a nice pair of trimmers, preferably ones that comes with precision blades for getting those tough to reach angles. You will also need a fine tooth comb and if you are feeling particularly fancy, some moustache wax for when you are done trimming. The first thing you’ll want to do is wet your moustache with some water. This will make it much easier to handle and cut, as trying to trim a dry moustache can be quite difficult. Depending on the thickness of your moustache, you’ll want to make sure it is damp, but not too wet. A good trick is to simply moisten a comb under some water and then run it through your moustache. After you have made your moustache wet, you’ll want to take a comb with very closely spaced teeth and comb your mustache until it is neat and tidy. This will be easy to do with a wet moustache, but the reason you’ll want to do this is so your moustache hair is perfectly groomed and smooth. This, coupled with the fact that it is damp, will best allow you to trim your moustache hair exactly the way you want it. You will first want to determine how long you want your moustache to be. 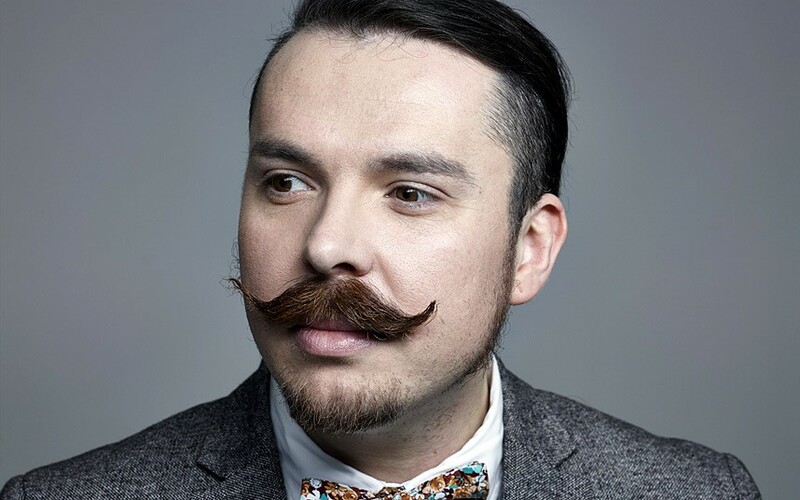 If you have a thinner moustache, you might want to extend the length of where you plan to trim. However, if you have a thick moustache, you’ll want to trim it right on the edges of your lips, if not a little shorter than that. You can accomplish this by using a standard set of mustache scissors or some trimmers with a set of precision blades. You just have to be careful, as you don’t want to end up with uneven moustache ends! This step will likely result in removing most of the hair you want to get rid of, which means you need to be extra careful when doing it. As previously stated, you don’t want to trim off too much hair and leave your moustache looking ridiculous! What you will want to do is take your comb (preferably a fine tooth comb) and run in through your moustache. However, you’ll want to stop it so there is hair showing through the teeth of the comb. You will then use your trimmers or scissors to carefully trim off the hair. You will want to repeat this process multiple times to ensure that both sides of your moustache are even. After doing so, your moustache should look neat and well-groomed. Obviously getting the sides and the bulk of your moustache are the most important parts, but many men forget to trim the top of their moustache, which can make it look uneven, especially if there are some long hairs that stick out. In order to prevent this, you’ll want to get a clear shaving gel and apply it to the area around the top of your moustache. This will allow you to see the edges of the moustache while you trim it. You’ll obviously want to be careful, as taking too much hair off at once will destroy all of the hard work you have done up to this point. After you are satisfied with everything, all you have to do is comb through your moustache a couple of times in order to get out the last couple of loose hairs, check to see if there are any long hairs out of place, and then apply some wax or oil to your moustache to make it look healthy and clean. Everyone has their own techniques when it comes to managing their facial hair, but if you are growing a moustache for the first time and don’t have any experience when it comes to trimming facial hair, you’ll definitely want to follow these tips. Otherwise you run the risk of ruining what could very well be a great moustache and no one wants to do that!